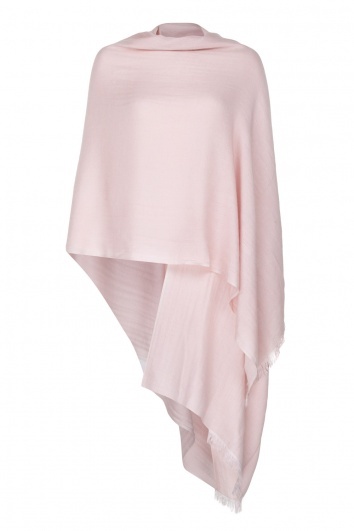 We now introduce our popular pale pink pashmina in cashmere and silk. This pashmina is light, very fine yet warm making it ideal for those cooler summer days and evenings. Worried about feeling chilly? And you want to look great too! Stay warm, look cool in a 50% Cashmere 50% Silk pashmina. Light and fine yet warm this pale pink cashmere pashmina shawl wrap scarf is ideal. Offering great value-for-money the cashmere and silk yarns breathe whilst giving warmth. Ideal as a wedding pashmina shawl wrap scarf and for other formal occasions, this pale pink pashmina shawl wrap scarf can be worn in so many ways. The ideal accessory. Our popular pale pink pashmina shawl wrap scarf in 50% cashmere and 50% silk. Stay Warm, Look Cool. Comments: Unfortunately the Pashmina I ordered was not suitable. I had no trouble returning it and I was extremely pleased with the whole shopping experience. Refunded immediately. Comments: I ordered a pale pink pashmina 50% Cashmere and 50% silk, it is beautiful and I really appreciated the handwritten card enclosed addressed to me by name, that was a nice touch. I liked it so much I ordered a 2nd pashmina in blue for my Mother. It is is great to order the mix of materials that suit you. The colours on the web site are a good representation of what you get. The pashminas were delivered by post and beautifully packaged the day after they were ordered. Comments: The service and delivery was first class and the quality of the pashmina excellent, would certainly buy from them again and highly recommend them to friends and family. Lovely personal service and good quality and colour true to description of the pashmina. Beautiful colour and very soft. Comments: Very quick delivery and lovely soft pashmina. Comments: Great service with personal touch. Beautiful colour - excellent quality. Loved it!